The Singer's Musical Theatre Anthology: Duets, Volume 4 - Book/Online Audio: Book/Online Audio [With MP3] (Paperback) | The Drama Book Shop, Inc.
(Vocal Collection). 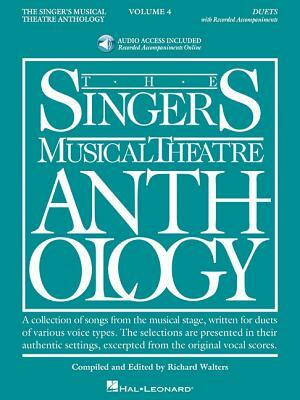 A collection of songs from the musical stage, written for duets of various voice types. The selections are presented in their authentic settings, excerpted from the original vocal scores. Contents: ALADDIN: A Million Miles Away and A Whole New World * AMAZING GRACE: Someone Who Hears * ANASTASIA: In a Crowd of Thousands * BIG FISH: Time Stops * THE BOOK OF MORMON: Baptize Me * THE BRIDGES OF MADISON COUNTY: Falling Into You and Before and After You/One Second and a Million Miles * BRIGHT STAR: I Had a Vision * DEAR EVAN HANSEN: Only Us * FINDING NEVERLAND: What You Mean to Me * FIRST DATE: Something That Will Last * FROZEN: Love Is an Open Door * A GENTLEMAN'S GUIDE TO LOVE & MURDER: Better with a Man and Inside Out * GHOST THE MUSICAL: Here Right Now * HAMILTON: Dear Theodosia * IF/THEN: Some Other Me * LA LA LAND: City of Stars and A Lovely Night * LITTLE WOMEN: Some Things Are Meant to Be * NATASHA, PIERRE & THE GREAT COMET OF 1812: Sonya & Natasha * NEWSIES THE MUSICAL: Something to Believe In * ONCE: Falling Slowly * SCHOOL OF ROCK: Children of Rock * SHREK THE MUSICAL: I Think I Got You Beat * SIDE SHOW: I Will Never Leave You * SOMETHING ROTTEN: I Love the Way * WAITRESS THE MUSICAL: You Matter to Me.